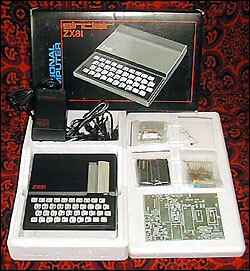 The ZX81, Sinclair's third computer, sparked a popular mania for computing following its launch in 1981. The machine was shipped in two versions: as a traditional self-assembly kit (right) and, more popularly, as a ready-assembled machine which only needed to be connected to a television and power supply before it could be used. In modern terms it was one of the first "plug and play" computers. By today's standards the ZX81 is laughably primitive: only 1K of memory, no colour or sound and a notably unresponsive touch-sensitive keyboard. Even by the standards of the time, its technology was basic. The ZX81 owed its success not to its capabilities but to that most elusive quality, being the right product in the right place at the right time. It attracted a great deal of attention by Sinclair's traditional sales route, mail-order - 300,000 ZX81s were sold that way by the end of January 1982 - but its key breakthrough was on the British high street. It seems strange these days, when shops selling computers are so ubiquitous, but back in 1981 there were very few shops selling computer equipment. The ZX81 could not have succeeded in the way that it did without the fortuitous involvement of the British newspaper chain W.H. Smith. The company was a long-established high street presence which had gone somewhat stale by the early 1980s. Seeking to reinvigorate its business, Smiths agreed to stock ZX81s in selected stores across the UK. The response was phenomenal, tapping into a previously unsuspected mass market for home computing. By February 1982, Sinclair Research was making over 40,000 ZX81s a month and still could not keep up with the demand. Within two years of release, the ZX81 had sold over a million units. The huge success of the ZX81 virtually created the British home computer market. Many competitors sprang up to take advantage of the tidal wave of public enthusiasm for home computers. Hundreds of software and hardware manufacturers sprang up almost overnight to support the new market. More seriously for Sinclair, a flurry of rival computer manfacturers entered the market. Most were seen off relatively quickly - machines such as the Oric-1 and Dragon 32 failed to make much impact - but some of the competitors, such as Acorn (itself founded by ex-Sinclair employees), survived and prospered. ZX81s were exported to the United States in considerable numbers - 15,000 a month - suggesting that, as in Britain, there was a huge untapped market. The ZX81 was actually manufactured by an American company, Timex Inc., operating from its factory in Dundee, Scotland. From the outset it was clear that Timex was the ideal partner for Sinclair to use in its attempt to crack the crucial United States market. Between 1981-83, the Timex/Sinclair partnership produced two modified versions of the ZX81 for the US market. (See the Timex/Sinclair pages for more information).